During my two years of VCE – years 11 and 12 of secondary school in Victoria – I swear I kept the canteen running from my addiction to Hedgehog Slices. Jam doughnuts were a close second. Very close. This dwindled out when I started my B. Science and Monash Uni’s Cafe Cinque Lire had ah-MAZING citrus tarts. Seriously amazeballs. It made 8 am starts with 2 hours of biology and chemistry bearable – I wasn’t to know that, by 2nd year physiotherapy, 2 hours was a walk in the park; try 5 hours. However, when I moved to Melbourne Uni to start my physiotherapy degree, Thresherman’s Bakehouse near Lygon St had cheap and delicious custard tarts. After moving to Seattle and having to deal with not only HFCS – for those of you back home in Australia it’s corn syrup that has been chemically altered to change over half of its glucose to fructose – but an increase in my sensitivity to wheat as well, I had to cut baked goods from my life unless they were homemade. Combine this with the fact that I haven’t even seen a hedgehog slice in the US, last summer I decided it was high time that I made my all-time favourite slice. This contains coconut. While coconut is no longer listed as a FODMAP by Monash University, some people are sensitive for other reasons. 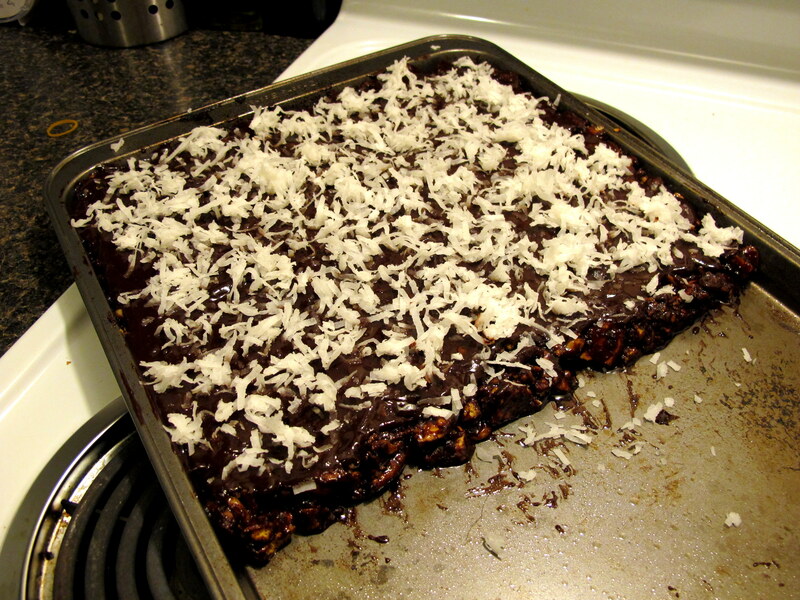 I use unsweetened desiccated coconut. 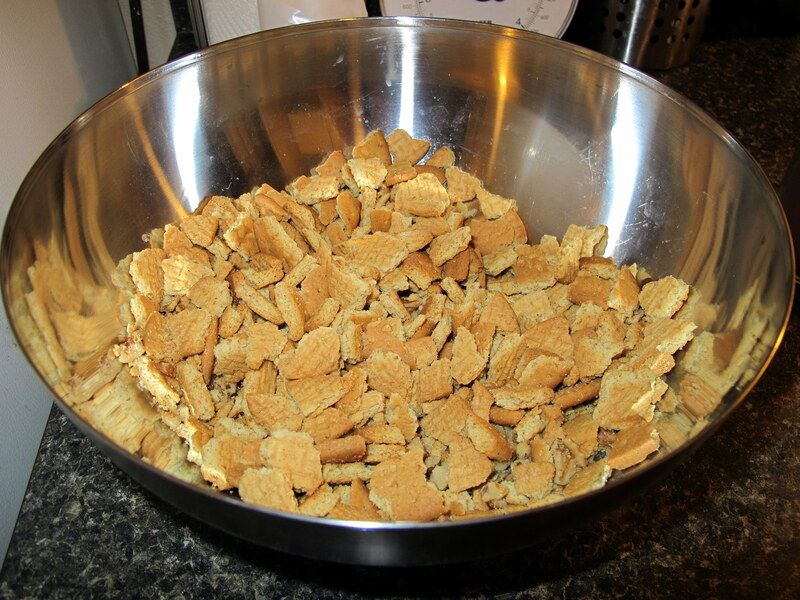 The biscuits used can either be store bought GF/FF plain biscuits – think Arnott’s Marie biscuits from Aus – or roll the almond meal pastry mixture flat onto a baking tray and completely blind bake it to form plain biscuits which can then be crumbled and used instead. A serving of 20 almonds or more is considered high in FODMAPs. If you limit yourself to one or two pieces of this, you should be right, unless you are particularly sensitive to GOS’s. Butter could be replaced with the same amount of coconut butter. Although I use dark chocolate and cocoa powder, which has less lactose than milk chocolate, be aware that this might cause a reaction in those who are sensitive to lactose. This mixture uses raw eggs. 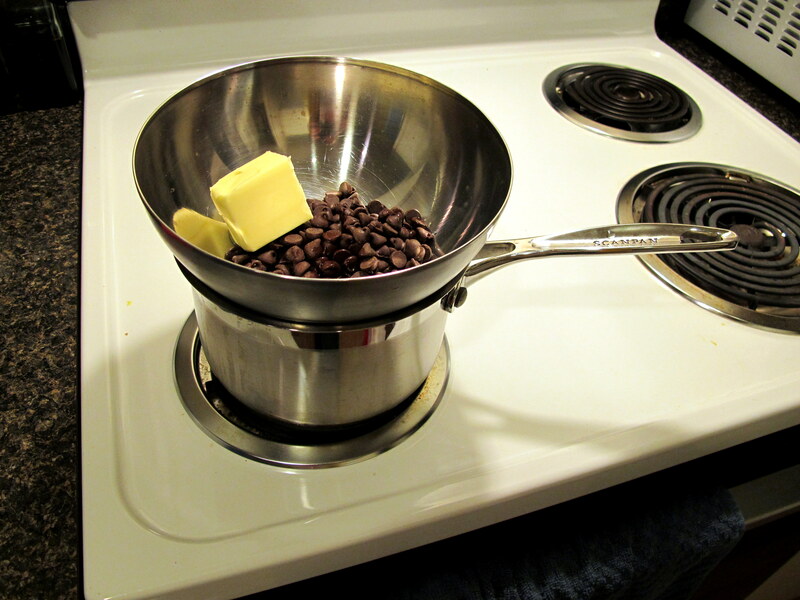 They are added to the hot butter mixture, so they will cook but not at length in an oven. To be safe, I would say this is not safe for consumption by pregnant women or infants. If you can tolerate it, condensed milk would provide the same binding properties that eggs would. Just be sure that, if you buy the sweetened version, you know what it is sweetened with. The original recipe called for 1tbsp. dark rum, instead of maple syrup. You can swap it back if you’d like. Adapted from Stephanie Alexander’s, ‘The Cook’s Companion’ to be FF/GF. 350-375 g/12.5-13 oz GF/FF Arnott’s Marie style biscuits or almond meal pastry biscuits. Grease a baking tray’s base and sides and set aside – should be around 20 cm/8 in square with edges but if it’s a little bigger, like mine was, don’t worry. Put the biscuits in a marinade bag and smash them with a rolling pin. You want chunks, not powder, so don’t crush them too much. 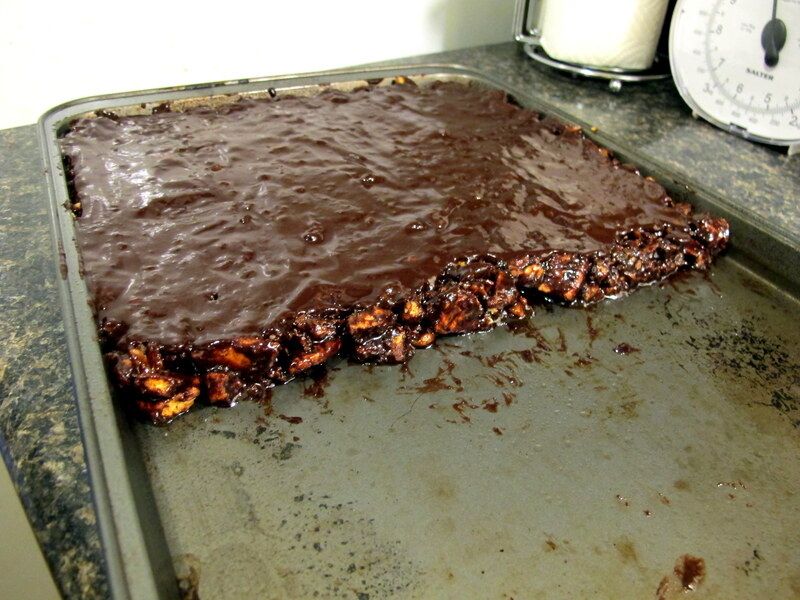 It’s very cathartic, so I recommend making this if you’re angry – chocolate and stress release in one! Melt butter and dextrose until well combined, then add in the cocoa powder and mix until completely smooth. Add in the lightly beaten eggs or condensed milk and mix until smooth once more. At this point, you can either let the mixture cool before adding the biscuits and walnuts, or mix them in anyway – it will just mean the mixture takes longer to set later on. If you feel more condensed milk is necessary (i.e. the mixture is too dry) add it now. Once the dry and wet ingredients are mixed though, you can press them into the greased tin you prepared earlier. Condense the height and even it out with a spatula. I only had a large baking tray and it worked without any issues. 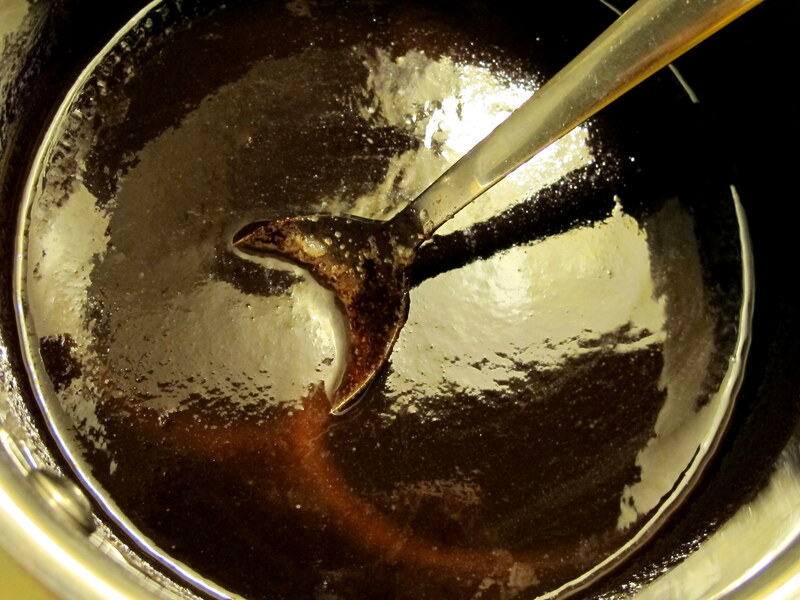 To prepare the icing, melt the dark chocolate, butter and maple syrup (or rum) in a double boiler until smooth and creamy. Pour over the slightly cooled base, being careful if you used a bigger pan than necessary, as I did. You don’t want to lose the icing on the uncovered portion of the baking tray. 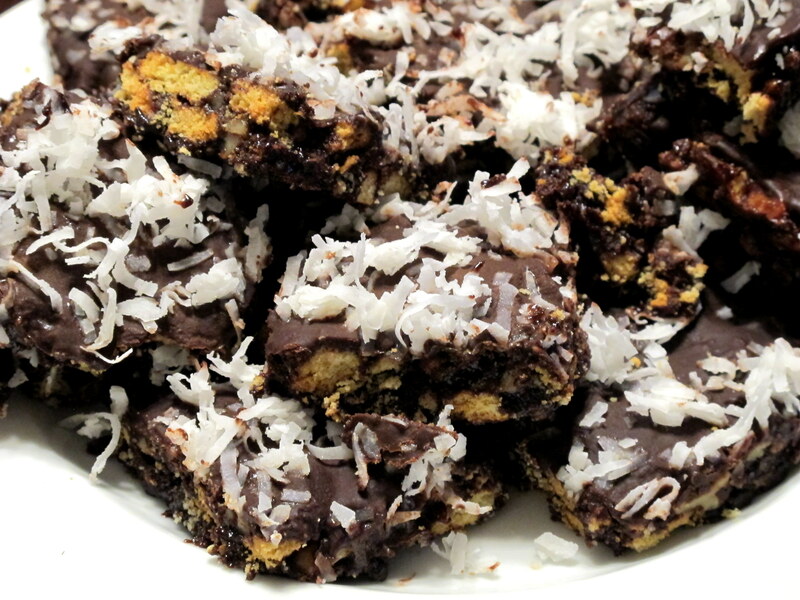 Sprinkle with as much shredded desiccated coconut as you’d like and refrigerate for at least 3 hours before cutting them into 5 cm/2 inch squares. These are best made the day before eating, so they can really firm up in the fridge. Store them in the fridge for no more than a week, due to all the dairy and the potentially uncooked eggs. They go really well with a cup of Earl Grey tea. Enjoy! And if you use the condensed milk option, let me know how the slice turned out. 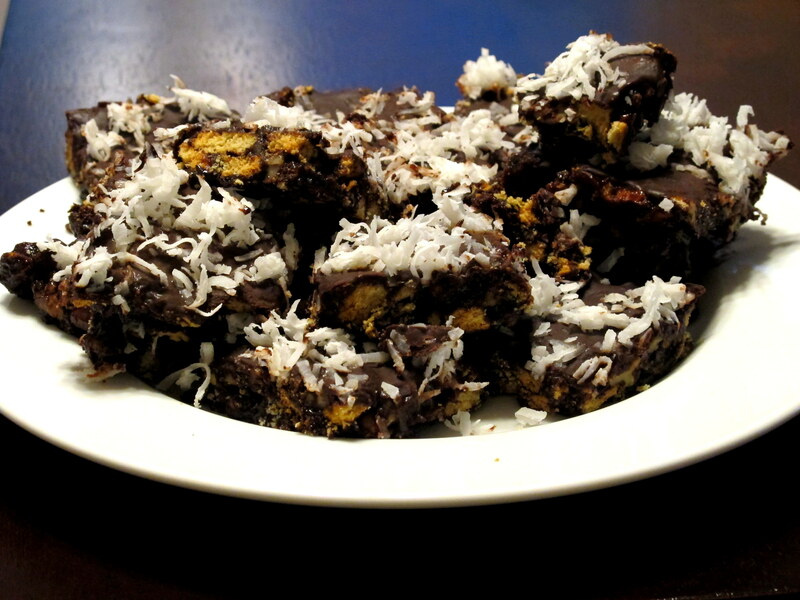 This entry was posted in Australian Cuisine, Biscuits and Cookies, Mousse, chocolates & custard, Slices, Sweets and Desserts and tagged Aussie, Australia, chocolate, coconut, dark chocolate, dessert, egg free, eggs, FODMAPS, food, fructose friendly, fructose malabsorption, gluten free, healthy, hedgehog, hedgehog slice, home-cooked, homemade, low fructose, maple syrup, nuts, Seattle, slice, stress release, stress relief, sweet. Bookmark the permalink.